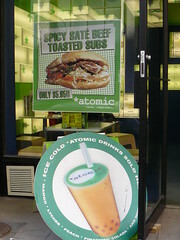 What’s Atomic Tea taste like? Today, while I was waiting to chat with Dragons’ Den entrepreneurs Jessica and Russell (here is my video interview with them), I decided to interview some *atomic customers and let them tell you their choices of *atomic tea and may be address one common CBC Dragons’ Den forum question from outside of Calgary — What’s Atomic Tea taste like? These interviews are uncut and unedited, and the customers were free to say how they feel. Overall, they quite like the taste of *atomic tea. And then I chatted with Calgarians Tony, Jenny, Angel, and Richard. Next I chatted with some visiting guests from Northern Ontario John, Marty, and their son (I missed his name due to some background noise). 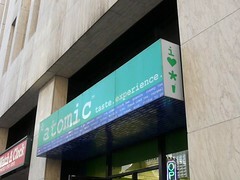 Finally, I chatted with one of the biggest fan of *atomic Tina (she has been a loyal customers for 21.5 months). Her story is especially interesting as, I think, it illustrates part of the operating philosophy of *atomic. This entry was posted on Friday, October 19th, 2007 at 9:40 PM and is filed under Business, Calgary, Canada, Dragons' Den, Entrepreneurship, food. You can follow any responses to this entry through the RSS 2.0 feed. Both comments and pings are currently closed.